Right now you can get this Monster High Deluxe High School for ONLY $29.62 Shipped (Retail $129.99)! 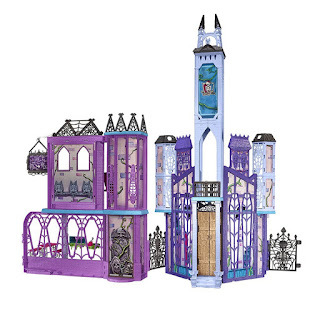 Explore the mysteries of Monster High with this play set that captures the iconic school in brilliant color and monster-scale! Extra-large and brightly colored, it features multiple levels and rooms with monster surprises -- like the office of Headmistress Bloodgood, which is revealed when the clock tower is opened. The front hallway doubles as a party room, with radio booth and signage in the room above and tentacles that pop out from the locker to make a seat. Take a favorite class in the classroom with its blackboard and chairs, and soak up ancient knowledge in the Library/Study Howl. Grab a bite in the Creepateria -- there's a lunch line, register, table and tray. Hang upside-down in the Vampire Lounge -- use the gore-geous pink and black quilted chair that hangs from the ceiling or remove it and clip in your doll's feet for the ultimate vampire experience! Expand the school for more play and display possibilities, or close up for more convenient storage. There are 14 dolls clips included for monster play and display (dolls sold separately).